There's an exception to the rule that all DNA viruses need to get to the nucleus in order to replicate. Poxviruses do not require to get into the nucleus because they can make protein from their very own DNA-dependant-RNA-polymerase. That is fine. But then, how do they make new DNA (for daughter virions)? Do they also have their own DNA-dependant-DNA-polymerase? Does the pox virus also have its own DNA-dependant-DNA-polymerase? If yes, is it unique in having so? How about other DNA viruses? The rule that they need to get into the host nucleus - is it for making protein using the host DNA-dependant-RNA-polymerase or for replication using the host DNA-dependant-DNA-polymerase? Or for both? Do all other DNA viruses need to get integrated into the genome to be able to replicate, and do so along with the cell? Are there instances where the host DNA-dependant-DNA-polymerase is expressed at times other than the cell's S-phase? Are there viruses that replicate inside the cell's nucleus without being integrated into the genome? I know that's a lot of questions! Hope someone does help. Note: Discussion limited to those viruses infecting eukaryotic cells. Also excluding Hep B (hepadna virus). Probably I won't be able to answer all of your questions satisfactorily, but let's begin one by one. Does the pox virus also have its own DNA-dependant-DNA-polymerase? The replication of poxvirus is unusual for a virus with double-stranded DNA genome (dsDNA) because it occurs in the cytoplasm, although this is typical of other large DNA viruses. Poxvirus encodes its own machinery for genome transcription, a DNA dependent RNA polymerase, which makes replication in the cytoplasm possible. Most dsDNA viruses require the host cell's DNA-dependent RNA polymerase to perform transcription. These host DNA are found in the nucleus, and therefore most dsDNA viruses carry out a part of their infection cycle within the host cell's nucleus. If yes, is it unique in having so? Some viruses also encode special DNA polymerases, such as Hepatitis B virus DNA polymerase. These may selectively replicate viral DNA through a variety of mechanisms. Retroviruses encode an unusual DNA polymerase called reverse transcriptase, which is an RNA-dependent DNA polymerase (RdDp). It polymerizes DNA from a template of RNA. Herpes simplex virus (HSV) encodes seven proteins necessary for viral DNA synthesis—UL9 (origin-binding protein), ICP8 (single-strand DNA [ssDNA]-binding protein), UL30/UL42 (polymerase), and UL5/UL8/UL52 (helicase/primase). The rule that they need to get into the host nucleus - is it for making protein using the host DNA-dependant-RNA-polymerase or for replication using the host DNA-dependant-DNA-polymerase? Or for both? Most DNA viruses replicate in the cell nucleus, which is where cellular replication and transcription proteins are localized. After infection, the nucleocapsid of DNA viruses is therefore usually delivered to the nucleus where uncoating occurs. An exception is poxviruses, which replicate in the cytoplasm of infected cells. 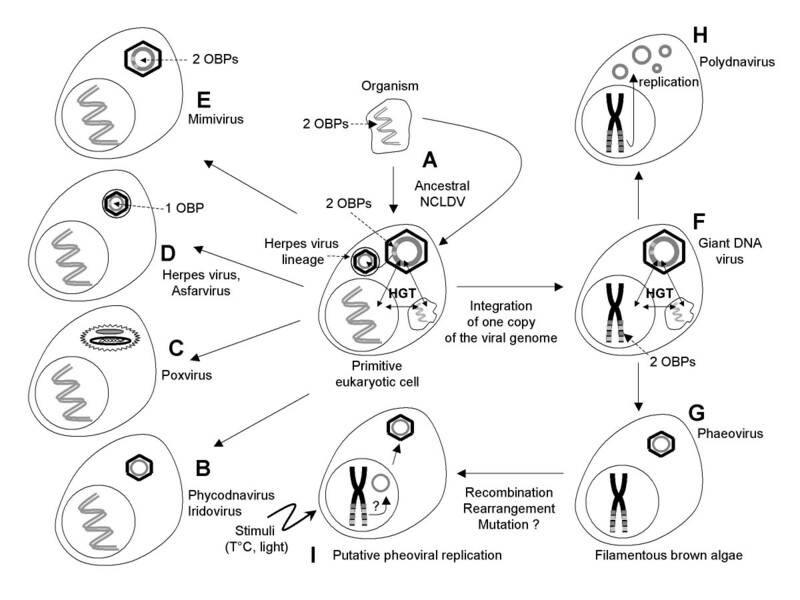 The first stage in the viral replication cycle is expression of the viral early genes. Transcription of these genes occurs using cellular RNA polymerase II and cellular transcription factors. These proteins bind to the viral DNA in regions called early promoters/enhancers, and promote synthesis of the early pre-mRNAs. Once the viral early genes have been expressed, and the cells have been induced to enter S phase, viral DNA is replicated. This occurs in the nucleus of infected cells, and gives rise to new viral genomes. Many hundreds or thousands of new viral genomes can be produced in the nucleus of a lytically infected cell. Are there instances where the host DNA-dependant-DNA-polymerase is expressed at times other than the cell's S-phase? Most DNA viruses replicate in the cell nucleus, which is where cellular replication and transcription proteins are localized. An exception is poxviruses, which replicate in the cytoplasm of infected cells. Wait! There's a difference between being inside the host cell's nucleus and being integrated into the host genome. Integration of the viral genome into the host genome requires a special enzyme called integrase and, you know, DNA viruses don't have integrase because they don't need it. So your question can be changed a bit to Are there viruses which replicate inside the cell's nucleus by getting integrated into the genome? Now, I could find only one such example i.e. Ectocarpus siliculosus Virus (EsV). Ectocarpus siliculosus virus-1 (EsV-1) is a lysogenic dsDNA virus belonging to the super family of nucleocytoplasmic large DNA viruses (NCLDV) that infect Ectocarpus siliculosus, a marine filamentous brown alga...the EsV-1 and FirrV-1 genomes encode a large putative integrase/recombinase for which no counterpart exists in current protein databases. Only the Tyr-recombinase domain at the carboxy terminus of this enzyme is similar to phage integrases. Therefore, this enzyme might be involved in the integration and/or recombination of the integrated viral fragments. Not the answer you're looking for? Browse other questions tagged genetics dna virology or ask your own question.